I love Spotlight, Tiger’s search feature, but as anyone who’s used Spotlight extensively will surely agree, it’s still rough around the edges. So I guess I should say that I love the promise of Spotlight. And apparently I’m not alone: Since Tiger was released, a number of third-party utilities have popped up to help Spotlight reach its potential. A few weeks ago I discovered one that fixes my biggest Spotlight annoyance, as well as provides a solution to a request we see on a weekly basis in the Macworld forums . First my own Spotlight beef: I’ve got a number of external hard drives connected to my Mac, two of which are “clones” of my main hard drive—yes, I’m a compulsive backer-upper. This setup presents two problems for me as far as Spotlight goes. First, it means that Spotlight spends three times as much time indexing as it would if it were only indexing my main hard drive. Second, whenever Spotlight finds a document, it finds three copies of it—the original and the copies on the two backup drives. (And Spotlight’s default display doesn’t make it easy to figure out which copy is which.) So I’d really like Spotlight to index only my main drive. Now, the Spotlight-savvy reader is probably thinking, “You should just add the two backup drives to Spotlight’s Privacy list in System Preferences—that keeps Spotlight from indexing those drives. Duh!” Ah, but if only it worked for me. You see, being the good backer-upper that I am, I often remove my FireWire backup drives to place them in an Undisclosed Location for safe keeping. (The old “offsite storage” trick.) And whenever I plug one of the drives back in, Spotlight—which apparently has a case of short-term memory—promptly begins to index it. A quick glance at Spotlight’s Privacy list shows that the drive is apparently drivona non gratis . I can drag the drive into the list again, which stops the current indexing, but the next time I disconnect and then reconnect the drive, the game starts anew. 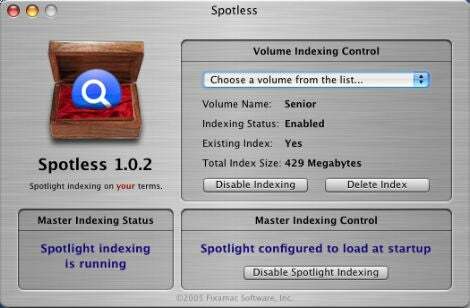 Various tweaks and incantations for fixing this problem are floating around the Web, but the solution I’ve settled on is Fixamac Software’s $8 Spotless 1.0.2 ( ), which gives you per-volume control over Spotlight indexing. Choose a mounted volume from the pop-up menu, and Spotless displays its current indexing status (Enabled or Disabled); the status of the current Spotlight index for the volume (Yes, Partial, or No); and the total size of the volume’s index (a surprisingly large 429MB for my boot volume). You can choose to permanently disable indexing for a volume by clicking the Disable Indexing button, and the Delete Index button will delete the existing index to free up some space. Once you disable Spotlight indexing for a volume, it remains disabled, even if you disconnect and reconnect the drive. (In fact, even if you connect the drive to a different Mac!) The only way to re-enable indexing for the drive is to do so using Spotless—or to erase the drive, which will delete all Spotlight settings for that drive. Note that if you disable Spotlight completely, not only will you not be able to use Spotlight itself, but you won’t be able to use any Spotlight-dependent features, such as the Finder’s search box. You’ll have to do without such functionality or use a third-party search utility such as EasyFind. Just as Spotlight has room to improve, Spotless has a few shortcomings I’d like to see addressed in future versions. For example, I’d like Spotless to provide a summary list of connected volumes and their current indexing status so you don’t have to view each one separately. And the Spotless volume pop-up menu can be a bit confusing; for example, the menu doesn’t necessarily reflect the volume displayed in the main window. Finally, it would be useful if the settings made in Spotless—for example, disabling indexing for a volume—were reflected in Spotlight’s Privacy list in System Preferences. But those are mainly cosmetic complaints. In terms of disabling and enabling Spotlight indexing, Spotless is, well, fairly spotless.